"The most important form of government is father, mother, and children," says the former Republican presidential candidate. Well, that settles it. 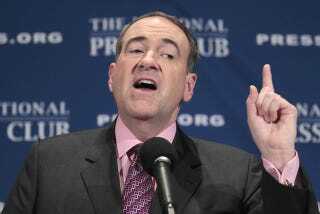 Mike Huckabee loves the patriarchy. He wants to hold hands with it and buy it jewelry and marry it and lord over it like a father in "the most important form of government" lords over his servant-wife and child-farmhands. Huckabee's been on a bit of a tear lately, last week saying he thought that Barack Obama wasn't making good decisions for the American people because he was raised in Kenya and then later going on to say that Natalie Portman shouldn't have appeared at the Oscars all pregnant and unmarried like that, making unwed motherhood look glamorous and fun. Huckabee helpfully pointed out that most unwed mothers don't have the same kind of money that Portman does and thus can't afford baby-tending staffs. Thanks for the insight, Huckabee. I had no idea that most single mothers were not millionaires.